A year ago, at the Quantum Tantra Ashram, while working on a design for a time machine, I discovered a brand new law of nature. Something like this had happened before. In 1982 I published a design for a time machine (FTL communicator based on a hypothetical quantum cloning device) that I called FLASH. The FLASH concept was refuted by William Wooters & Wojciech Zurek who proved the famous "quantum no-cloning theorem" which is now playing a central role in the field of quantum computing. Unlike classical computation in which you can always back up your data by exactly copying the bits in a register, the no-cloning theorem is a basic law of nature that prevents you from exactly copying a register of qubits (quantum bits). On the other hand, the no-cloning theorem proves itself useful in the design of quantum encryption schemes whose security is guaranteed by God Herself. 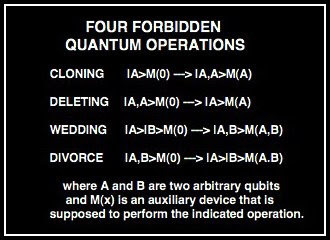 Since the quantum equations are reversible, anti-cloning (a special kind of deletion) is also forbidden. Meanwhile, back at the Ashram, I was obsessing on a design for a new time machine my sweet Muse had laid upon me that I fancifully named ETCALLHOME. Just prior to publication on the online physics arXiv, Lev Vaidman from Tel Aviv refuted it. So I published both my scheme and Vaidman's refutation here to warn wannabe superluminal signaling designers against this approach. But ETCALLHOME was only one of a class of FTL communicators based not on cloning but on the ability to coax two unknown quanta into the same state--a process I call "quantum wedding". Could I show that not only was ETCALLHOME an impossible FTL scheme but so were all such quantum-wedding-based FTL devices? With a little algebra, similar to the arguments of Wooters and Zurek, I was able to propose and prove a brand new law of nature--that a pair of quanta cannot be wed. Furthermore, because of quantum reversibility, nature also forbids quantum divorce. A single quantum can't be known. 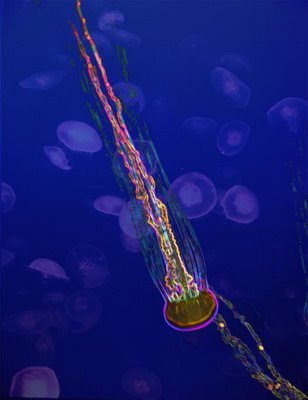 A single quantum can't be cloned. To reverse cloning, No, She said. And a pair of quanta can't be wed.
PCs and Macs don't work this way. At least mine didn't yesterday. You're sounding suspiciously like Terence McKenna, who said "everything is code." Have you been ingesting funny mushrooms again?